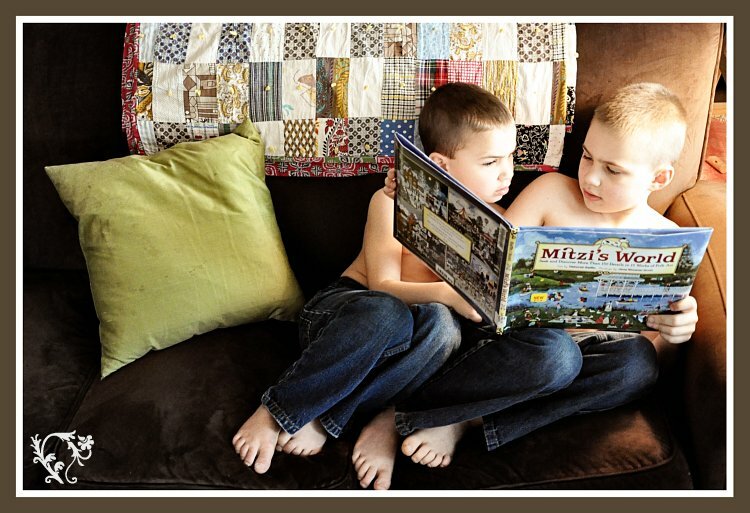 So many things I love about this photo...sweet brothers snuggled up together, great quote, a soft brown couch and that fabulous quilt! Just a great find or does the quilt come from someone special? How sweet they are! It is nice to see children getting along with one another instead of fussing with one another (or maybe yours don't fight w/ one another like mine? lol). The quilt behind them!!! Beautiful. Is there a story behind it? What a VERY sweet picture! Kiley & Lisa~ Yes, the quilt is sentimental. :) (Grandma, if you're reading this and I got it wrong, feel free to chime in :)). My grandparents got the quilt from the 'missionary barrel' when they were missionaries in Portugal some 55+ years ago. My mom had it and didn't want it anymore. She didn't know I had been wanting an old patchwork quilt very badly. Luckily, I caught her before she took it to the second hand store (Mom, I'm telling on you :)). The colors and patterns are really quite random, but I love it. I wish I had 5 more!! Lisa~ I should have emphasized the WHEN in that quote. :) They fight/wrestle/argue constantly. I took the picture to remind myself that peace happens occasionally!